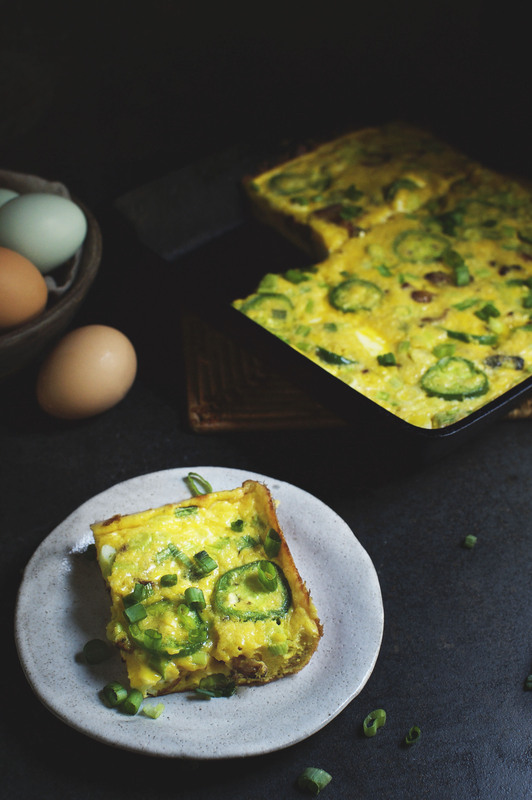 This Jalapeño Popper Frittata recipe makes a tasty breakfast or lunch. It works for low-carb, Atkins, ketogenic, LC/HF, diabetic, gluten-free and grain-free diets. 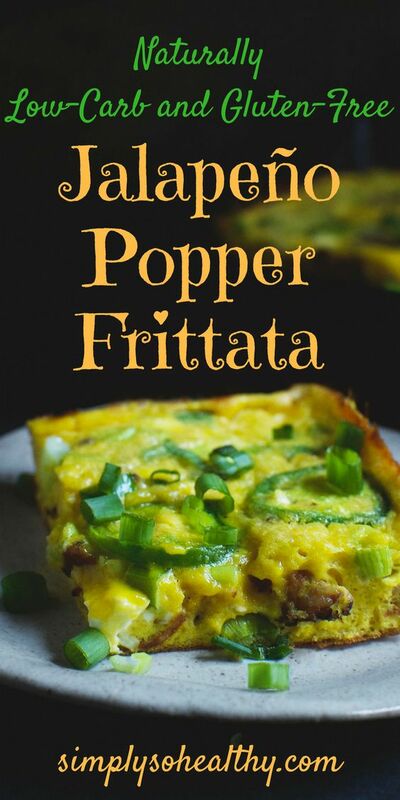 The flavors for this Jalapeño Popper Frittata recipe comes from my recent craving for spicy food. I’ve been seeing jalapeño poppers everywhere. They are all over Pinterest, Facebook, and food blogs. I love the idea of combining the cream cheese with spicy peppers. Adding a pop of green onions, Mexican cheese, and smoky flavors of bacon bring it over the top. Creating a frittata with these flavors makes a hearty and complete breakfast. I have a strange relationship with eggs. I didn’t eat them straight for a very long time. I enjoyed using eggs in baked goods like waffles and cakes, but I just couldn’t eat them by themselves. Then I got chickens. I love my chickens. I could spend a whole evening watching them forage around the property and interact with each other. They lay beautiful eggs in a variety of colors and the yolks are a lovely shade of orange. While egg production is a bit sporadic in the winter months, the girls really get to work in the spring and summer, producing dozen after dozen of eggs. I end up getting so many eggs in the warmer months, that I can’t use them all in my baking recipes. So I worked to get over my aversion to egg dishes. It took some time, but now, every time I eat eggs, I’m still surprised at how good they taste. I prefer them used as a base on which to create something grand. They make an exquisite flavor to mix with all kinds of food combinations. Some of my favorite recipes I’ve created are Low-Carb Crustless Taco Pie, Gluten-free Crustless Crab Quiche, and Black and Blue Hamburger Pie. All of these recipes are basically different varieties of quiches. With this recipe, I’m moving away from the quiche, and branching out into the frittata. A frittata is like a quiche without a crust. Unlike a quiche, it’s partially cooked on the stove and finished in the oven. This way of cooking makes it much faster to prepare than a quiche, so it shaves off a significant amount of time spent in the kitchen. 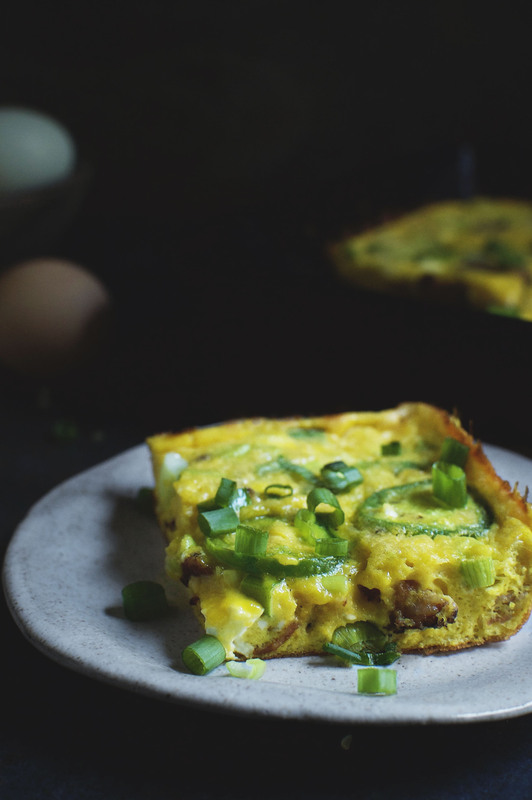 This Jalapeño Popper Frittata makes an easy and spicy start to the day! It also works well for a brunch, lunch or light dinner. Enjoy! 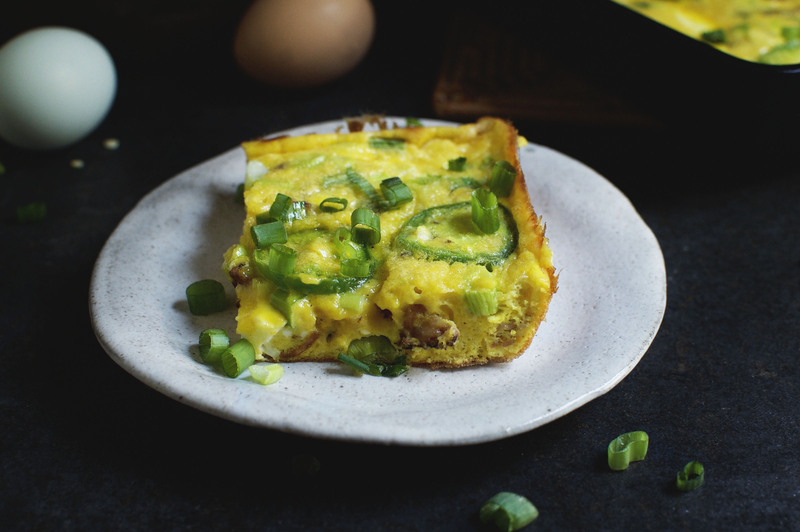 This Jalapeño Popper Frittata makes a tasty breakfast or lunch. It works for low-carb, Atkins, ketogenic, LC/HF, diabetic, gluten-free and grain-free diets. Preheat oven to 425º Fahrenheit. Cover a plate with a double layer of paper towels. Heat a medium skillet over medium high heat. Add bacon pieces. Cook bacon pieces, stirring occasionally, until crisp. Remove with a slotted spoon and allow to drain on the paper towel lined plate. In a large bowl, whisk together the eggs, sour cream, sea salt and pepper. Stir in the chunks of cream cheese, jalapeño peppers, green onion, mexican cheese and reserved bacon pieces. Heat a 9'square or 10" round cast iron or oven proof nonstick skillet over medium low heat. Add butter and melt, swirling to cover the skillet. Add the egg mixture to the skillet and cook stirring gently, until the eggs begin to set, but not scramble. When eggs begin to set, cook undisturbed, until they begin to set around the edges, about 2-3 minutes more. Transfer the skillet to the preheated oven and bake until eggs are just firm in the center--about 5 minutes. Remove frittata from the oven to a hot pad. If desired it may be inverted onto a platter by loosening the edges, holding the platter over the top of the pan with oven mitts and inverting. Cut into squares or wedges and serve. This frittata is amazing! And now I have breakfast made for the week. Great recipe! Thanks for trying one of our recipes! I’m so glad you enjoyed it! I love having breakfast ready to eat! I’m hoping to try this. You don’t mention that the Jalapeno peppers should be chopped – as written, the recipe would have exactly four pieces of pepper in it! The peppers should be sliced. I added the word “thinly” to make it more clear.